Almost five years have passed since the former pseudo-civilian government of Myanmar departed from half a century of authoritarian rule to embark on a tedious quest towards democratization. With last November’s general elections, the ruling Union Solidarity and Development Party (USDP), whose reins were held by the Burmese military (the so-called ‘Tatmadaw’), was ultimately removed from power and replaced by a civilian government led by world-renown democracy champion Aung San Suu Kyi. Ironically, however, the military’s loosening grip over politics due to the introduction of basic democratic reforms in the past few years has been paralleled by a dramatic escalation in human rights abuses against minority groups, first and foremost among them the Muslim Rohingya ethnicity. The Rohingya are a Muslim ethnic group known to have resided for over a millennium in the western part of what is today the Republic of the Union of Myanmar. But repression and discrimination in the modern-day Rakhine State against the native Rohingya community predates even the foundation of the modern nation itself in 1948. Systematic policies of persecution intensified particularly in the 1980’s. In 1989 the historically-established name for the region, i.e. Arakan, was replaced with its current name of Rakhine – an appellation that is preferred by the country’s overwhelming Buddhist majority. Violence against the Rohingya community of the Rakhine state in western Myanmar gained further traction in 2012 with another round of well-organized attacks carried out by several extremist groups identifying themselves as Buddhist nationalists. In the following years, inter-communal violence became so intense that, according to reports by the Human Rights Watch and Fortify Rights, they met the legal definition of “ethnic cleansing” and “crimes against humanity”. According to estimates by the UN Refugee Agency, the incidents in question involved the torturing and killing of more than 200 people, and caused the displacement of nearly 160,000 people. Since the breakout of inter-communal violence in 2012, more than ten percent of the remaining Rohingya population in the Rakhine state have fled Myanmar. Originally comprising over five percent of the country’s entire population at the end of British colonial rule, their numbers have consistently decreased for the past few decades as a result of highly discriminatory policies involving deportation and deprivation of citizenship. Today, the Rohingya are once again being forced to depart their ancestral homeland en masse. A vast majority of these people left the country by boat, seeking asylum across the Bay of Bengal. During this perilous journey, thousands of families trapped at sea are believed to have drowned off the coasts of Myanmar, Thailand, Malaysia, and Indonesia. Many suspected victims of human trafficking who were able to safely arrive at the shores of neighboring countries fell victim to forced labor and abductions for ransom by human smugglers who have exploited them for economic gain. Mass graves of forced laborers from the Rakhine state were discovered during a campaign launched by the Thai police in response to the boat crisis of May 2015, an event which has since drawn much international attention and resulted in increased pressure on the regional governments to prevent further deaths. Thanks to a sweeping crackdown by Thai authorities reinforced by a parallel campaign carried out in Bangladesh, human traffickers were dealt a great blow in the latter half of 2015. Unfortunately, the situation began to deteriorate again with traffickers abandoning vessels in the midst of the Andaman Sea, with thousands of asylum-seekers aboard, in order to evade authorities. Thailand is currently closed as a transit route for human smugglers, whose networks and logistics have been substantially disrupted. With the advent of the monsoon season, the smuggling season for ships carrying human cargo is also coming to a close. As a result, the number of Rohingya boatpeople is down sharply as compared to last year. Yet this may well be a temporary halt, with human traffickers biding their time before conditions ease once again next autumn. As long as there is continued demand for “maritime guidance” during the mass exodus of a people, smugglers will continue to exploit the immense “business opportunities” they find. Therefore, without a clear change in policy on the part of the new government in Myanmar, entire Rohingya families – those who can afford their own boats at the forefront– will continue to sacrifice all they have at the hands of international criminal networks. A large portion of those left behind in the Rakhine state by their asylum-seeking relatives is comprised of the most vulnerable segments of the society: i.e. children, the elderly, women, and the sick. Unable to withstand long journeys at open seas or work as manual laborers abroad, these segments of the population have to cope with desperate living conditions in nine temporary refugee camps for internally displaced people that lie outside the regional capital of Sittwe. 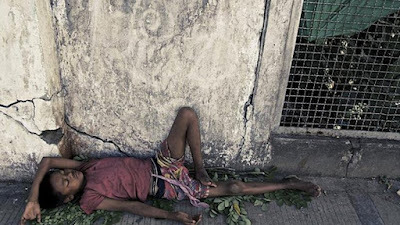 According to the UN Office for the Coordination of Humanitarian Affairs (UNOCHA), conditions in both these squalid camps and remote Rohingya villages are among the most miserable in the world as far as access to clean water, sanitation, food, and basic medicine is concerned. Many families are offered no choice but to struggle for survival in filthy, mud-built shelters that often become ruined during the rainy season. Living spaces in these camps are overcrowded, with entire families squeezed in single-room dormitories, even as food ration cards intended for refugees are commonly traded by officials. Similar conditions are also observed in other refugee camps hosting hundreds of thousands of Rohingya people across the border in Bangladesh and Thailand. Local eyewitnesses, human rights activists, the majority of international observers, and expat Rohingya communities alike condemn the former government for having encouraged, or at least turned a blind eye to, the plight of the long-persecuted minority population despite the 2011 initiation of a democratization process in the country. Laws restricting the Rohingya people’s freedom of movement, block their access to vital health care, and bar their young from receiving more than primary education are still in place. Due to such laws, the Rohingya are also not allowed to marry or have children without official permission. Moreover, the properties of those Muslim families who were massacred or forced out of their residences have been seized by local administrations to be redistributed among the Buddhist population in those regions, with all abandoned or plundered shops and workplaces cleansed from any sign of Muslim economic or cultural presence. There is more to this grim picture. A vast majority of individuals from a Muslim Rohingya background were stripped of their legal right to full citizenship through the Citizenship Law of 1982. Any formal identification they had managed to retain afterwards was nullified under former President Thein Sein, thus rendering the entire ethnic group stateless. Likewise, most Rohingya were excluded from the latest national census in 2014, and had their names removed from the voter list as recently as last November’s parliamentary elections. Now that Myanmar has a president handpicked for his loyalty by the country’s new de facto leader and Nobel laurate Aung San Suu Kyi, the time is ripe for genuine democratization. As the country has entered a new period with the National League for Democracy (NLD)-led civilian government taking the reins over power on April 1, the enormous challenge posed by the Rohingya situation demands a permanent solution. Addressing such a grave legacy requires daring and decisive action on the part of the new government before challenges to the NLD’s overwhelming mandate and internal unity emerge. If such a solution is not found, even a popular figure like Aung San Suu Kyi may not have second chance to solve this situation. Whether the new government can afford to sweep aside short-sighted policies of the old regime that were aimed to placate the fiercely nationalistic Buddhist grassroots groups, and whether they will withstand the resulting controversy, remains to be seen. What is certain is that catastrophic consequences that will surely result from a failure to take unpopular-yet-vital measures ensuring the nation’s long-term stability and development. The good news is that the next round of elections is years from now. All around the world hopes are high as to the determination of the democratically-elected government under Aung San Suu Kyi to shoulder responsibility and put the Rohingya ethnicity out of its longstanding misery in the forthcoming period. Indeed, in a last minute salvo, under military guidance the outgoing government lifted the state of emergency that they had imposed on the restless Rakhine state for nearly four years. But the abrogation of emergency laws should be supported by a series of complementary measures which will in turn precipitate a tangible amelioration of the Rohingya situation. Yet the view from the Rakhine state’s ramshackle capital of Sittwe is far from assuring spectators of the ushering in of an era of normalization for the Rohingya people. Beyond the main road in the city, internally displaced people are confined to the dusty and forlorn slum of Aung Mingalar. The neighborhood is fenced with barbed wire and heavily guarded by military checkpoints in order to maintain the strict segregation between the persecuted Muslim minority and the officially-favored Buddhist majority. Even though no outside observers are allowed to enter the camp, the apparently grim conditions there make any prospects for the reintegration of the Rohingya community, not to mention establishment of a broad-based, inter-ethnic national reconciliation process, look rather dim, at least for the time being.